The U.S. and Cuba are meeting for the first time since Washington permanently withdrew personnel from the U.S. Embassy in Havana. The first round of bilateral meetings between the U.S. and Cuba since Washington permanently withdrew personnel from the embassy in Havana will take place on Thursday in Washington, DC. For some, it will take heightened significance with the backdrop of the recent historic meeting between Donald Trump and Kim Jong-un of North Korea, where Kim agreed to denuclearize in exchange for better relations with the U.S. In the case of Cuba, tensions between the two countries intensified after Trump rolled back on some of former President Barack Obama’s historic détente with the island. A draw down in U.S. embassy personnel following mysterious incidents that have affected the health of U.S. diplomats and their families has further strained relations. The Bilateral Commission will be the seventh meeting the two countries have held since restoring relations in 2015. The last meeting was in September 2017 and it was the first time they met under the Trump administration. It took place under different circumstances than the previous meetings. The health incidents had been reported a few weeks prior and Trump had announced a rollback in Obama’s policy a few months before. The Bilateral Commission is the platform through which the U.S. and Cuba identify, prioritize, and schedule initiatives, including specific dialogues and working group meetings. Some of the topics covered are dialogues on human rights, law enforcement, claims, and migration, according to a State Department spokesperson for the Bureau of Western Hemisphere Affairs. John Creamer, Deputy Assistant Secretary of State for Western Hemisphere Affairs will lead the U.S. side. The State Department did not confirm who would be leading the Cuban delegation, but sources familiar with the meeting said it is Carlos Fernandez de Cossio, who has replaced Josefina Vidal as director of U.S. affairs at the Cuban Foreign Ministry. She was Cuba’s chief negotiator during the opening toward Cuba and is now the Cuban ambassador to Canada. The State Department did not respond to requests for comment about whether the U.S. would press Cuba about the unexplained health incidents during the meeting. 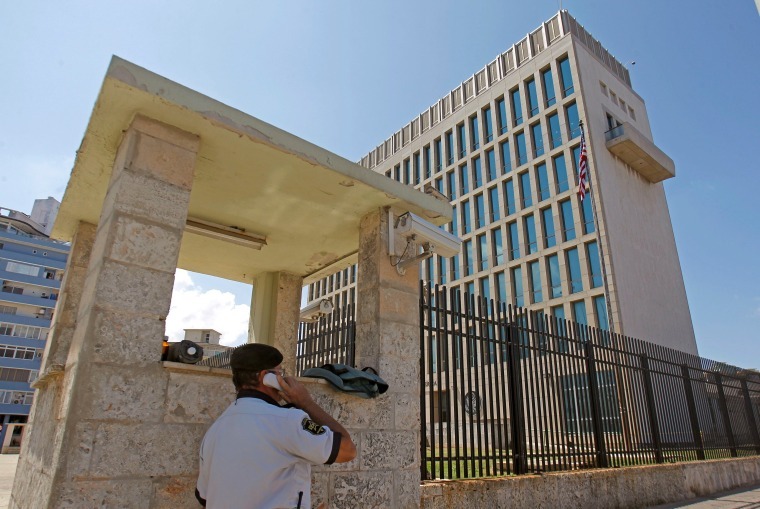 Last week, the U.S. withdrew two more people from the embassy due to health concerns. They are considered potential new cases but have not yet been medically confirmed. If confirmed by doctors at the University of Pennsylvania, where others affected have been treated, they will mark the 25th and 26th confirmed cases in Cuba. The incidents were first disclosed last year. The confirmed patients have a range of symptoms and diagnoses including mild traumatic brain injury and permanent hearing loss. In February, the U.S. made permanent its decision to withdraw 60 percent of its diplomats from Cuba, citing its need to protect American personnel. The U.S. has said it does not know who is behind it, but has argued Cuba is responsible for protecting diplomats on its soil. Cuba has denied any involvement or knowledge of the events. But Cuba still views the trade embargo on the island as the major obstacle in advancing relations between the two countries and in the development of their stagnant economy. Lifting the embargo still faces domestic opposition in the U.S.